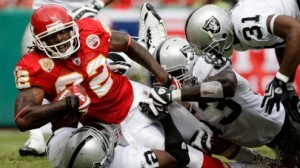 The Oakland Raiders and Kansas City Chiefs renew their rivalry Sunday in Oakland. The Raiders are 3 point home favorites. Although the Kansas City Chiefs and Oakland Raiders have combined for 5 wins this season, it is still one of the most intense rivalries in NFL history. The two rivals have been going at it since the days of the old AFL. While the playoffs are obviously out of the picture for both teams, there is still the matter of the worst record in football and the #1 pick in next April’s NFL draft. The Chiefs are tied with the Jacksonville Jaguars at 2-11 for the worst record in the league, and the Raiders are 3-10 this season. Every other team in the league has at least 4 wins. Kansas City is coached by Romeo Crennell and has lost 9 of their last 10 games. The Chiefs lost 30-7 last week at the Cleveland Browns. It is impossible to talk about the Chiefs without mentioning that two weeks ago linebacker Jovan Belcher killed his wife before going to the Chief’s team facility and committed suicide in front of team officials including Crennell and GM Scott Pioli. The Chiefs upset the Carolina Panthers the next day 27-21. Obviously, the emotions are still raw for everyone on the team. Kansas City is 5-8 ATS and the total is 6-7 this season. Oakland has lost six straight games under coach Dennis Allen. The last win for the Raiders came at Kansas City 26-16 October 28. The Raiders lost at home last Thursday night against the Broncos 26-13. Oakland is 3-10 ATS and the total is 5-8 this season. Since 2001, Kansas City leads the series against Oakland 13-10, but the Raiders have won 4 of the last 5 games in the series, including 2 in a row. Kansas City is averaging 335.6 yards per game on offense including 186.4 passing yards and 149.2 rushing yards. The Chiefs are #5 in rushing and #31 in passing. Kansas City is being outscored 27-15 this season. The Chiefs are #31 in scoring and #28 in points allowed. Kansas City is -22 in turnovers. The Chiefs have forced 24 sacks and allowed 31 this season. Kansas City is 70/187 on third and fourth down conversions. On defense, Kansas City is allowing 349.5 yards per game, including 218.2 passing yards and 131.2 rushing yards. The Chiefs are #9 in pass defense and #27 in rush defense. KC has 2 defensive/special teams touchdowns but has allowed 6. The Chiefs have used two quarterbacks this season. Matt Cassel has completed 58.1% of his passes for 1,796 yards with 6 touchdowns and 12 interceptions, along with 27 carries, 145 yards and a touchdown. He has been sacked 19 times this season. Brady Quinn has completed 60.6% of his passes for 794 yards with 2 touchdowns and 5 interceptions, along with 12 carries for 51 yards. He has been sacked 12 times this season. Quinn has started the last few games and will continue to do so. Running back Jamaal Charles has 240 carries, 1,220 yards and 4 touchdowns, along with 30 catches, 200 yards and a touchdown. Shaun Draughn has 53 carries, 206 yards and 2 touchdowns, along with 20 catches for 149 yards. Peyton Hillis has 64 carries, 204 yards and a touchdown, along with 10 catches for 62 yards. Leading receiver Dwayne Bowe is out for the season with a rib injury. He had 59 catches, 801 yards and 3 touchdowns. tight end Tony Moeaki has 28 catches, 396 yards and a touchdown. Dexter McCluster has 41 catches, 358 yards and a touchdown. Jon Baldwin has 18 catches, 261 yards and a touchdown. Other than the running backs no other Chief has more than 8 catches. Sixteen KC players are listed on the injury report including 7 defensive players and 4 offensive linemen. Oakland is averaging 358.8 yards per game on offense, including 277.7 passing yards and 81.2 rushing yards. The Raiders are in the top 15 in total and passing offense. The Raiders are being outscored 31-19 this season. Oakland is last in the league in points allowed. The Raiders are allowing 390.2 yards per game on defense, including 259 passing yards and 131.2 rushing yards. The Raiders are 26th or worse in all defensive categories. Oakland is -7 in turnovers. The Raiders have forced 17 sacks and given up 26 this season. Oakland is 62/187 on third and fourth down conversions. Oakland quarterback Carson Palmer has completed 60.8% of his passes for 3,805 yards with 22 touchdowns and 14 interceptions, along with 32 rushing yards and a rushing touchdown. He has been sacked 26 times this season. Running back Darren McFadden is listed as probable with an ankle injury. McFadden has rushed for 507 yards with 2 touchdowns on 150 carries, and also has 33 catches for 202 yards and a touchdown. Marcel Reece has 59 carries for 271 yards along with 47 catches, 472 yards and a touchdown. Mike Goodson, Jeremy Stewart and Taiwan Jones will also get a few carries. Goodson has a touchdown catch. Receiver Brandon Myers has 70 catches, 728 yards, and 4 touchdowns. Denarius Moore has 42 catches, 678 yards, and 6 touchdowns. Darrius Hayward-Bey has 37 catches, 562 yards and 4 touchdowns. Rod Streater, Derek Hagan and Juron Criner will also get some targets. Streater has 3 touchdown catches. Eight defensive players are listed as questionable, doubtful or out for Sunday’s game. Kansas City is 5-2 ATS in road games against teams with losing home records, 5-11 against AFC teams, 2-5 after allowing 350 yards and against AFC West teams, 1-4 after passing for 150 yards or less, 1-5 against teams with losing records, and 0-4 after rushing for more than 150 yards. The Chiefs are 8-1 ATS in their last 9 trips to Oakland. The underdog is 19-7-1 ATS in the last 27 meetings, and the road team is 21-5-1 in the same time frame. Oakland is 3-1-1 ATS in Week 15, 22-46-1 at home, 21-44-1 in December, 18-42-1 against teams with losing records, 3-7 after rushing for 90 yards or less, 10-25 at home against teams with losing road records, 2-5 after scoring less than 15 points, 1-4 against AFC West teams, 1-5 after allowing more than 250 passing yards, 0-6 after a straight up loss, and overall, 0-5 after failing to cover, 0-4 after passing for more than 250 yards, against AFC teams and on grass. The Raiders have covered 4 of the last 5 games against the Chiefs. The under is 16-5 in this series recently and 6-1 in Oakland. While both of these teams are terrible, Kansas City has Jamaal Charles and that is it on offense. Oakland can throw the ball but they can’t run. Both are terrible on defense as well. I think the Raiders win at home, but honestly you can’t really trust either of these teams. 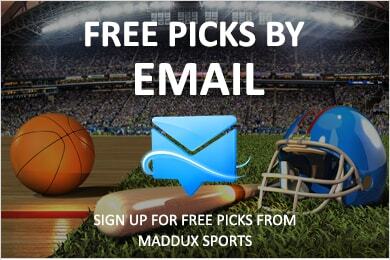 Get our best NFL picks now. Our Handicappers are the best in the business.